As with used oil collections, UES has an exceptional team of filter drivers ready to collect your used filters and assist you with keeping an organized workspace. To help you in maintaining a productive and attractive work site, UES can take the headache, mess and unsightliness of rundown filter drums away from your business site and replace them with something much better. Regardless of the filter type — be it industrial or automotive — as long as the filters have recoverable metal, UES can manage this material through a program that is sure to be more efficient and visually pleasing to your business than old, deteriorating drums. While recycling the scrap metal, filter contents, and oil disposal is the ultimate goal, UES understands that projecting a professional appearance to your customer is equally important. For this reason, we offer alternative containment for the storage of your spent oil filters. UES provides custom 95-gallon rollaway carts distinctly labeled for “Used Oil Filters.” They are sure to keep your business compliant, while also helping to keep your recycling area organized and presentable. Indoors or out, these carts will provide safe and dependable containment for the used oil filters generated at your location. For high-volume generators, we offer a large bin with a storage capacity of approximately 275 gallons. If your operation is using 55-gallon drums, the UES filter bin holds the equivalent of five full drums. While dependent on the size of the disposed oil filters, the UES bin is capable of holding up to 2,000 spent filters. UES also maintains a generous stock of materials — drums, rollaway filter carts, bins and more — to supply you with your containment needs. 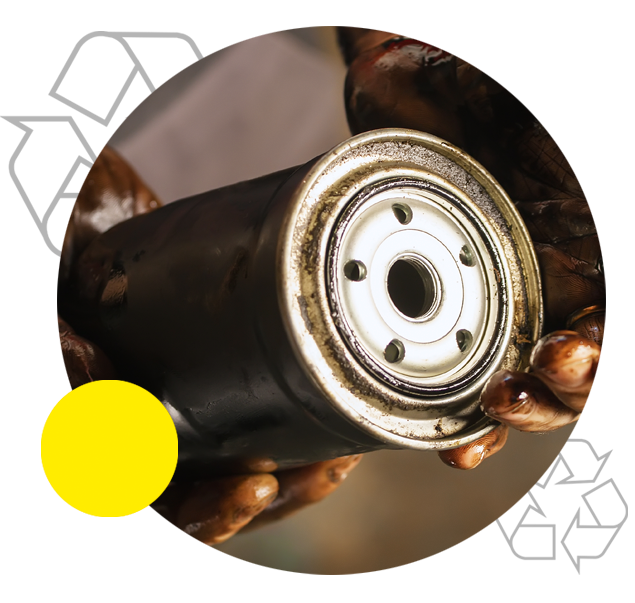 Whether you opt for a used oil filter cart or a filter bin, UES will ensure used oil filters generated at your location are handled and transported using custom equipment that is designed for safe operation.